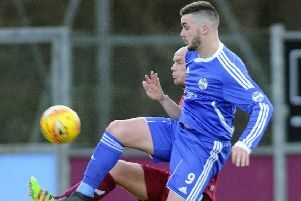 Cumbernauld United crashed out of the West of Scotland Cup after their worst performance of the season against East Kilbride Thistle. United could have no complaints over their 2-0 loss to the League One side who, ironically, now travel to Guy’s Meadow to play Kirkintilloch Rob Roy in the quarter-final. There was little between the teams in the early stages with the visitors creating the first chance when McCabe headed over from a Scullion free kick. But United were finding to difficult to get their passing game going on a poor surface, and the warning signs were evident when first a shot from Gillespie went narrowly past, followed by an effort from Toucher flying over the crossbar. It didn’t take long for the Championship promotion contenders to fall behind though. A free-kick wide on the left was controlled by Reece Clark whose fine overhead kick to give the home team a well deserved lead. Within five minutes United should have been level when Lennon broke free down the right, his cutback finding Hall who elected to pass to Callander who somehow managed to send his shot over the crossbar from six yards. 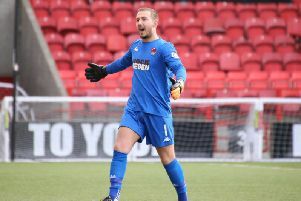 Worse was to follow when Thistle increased their lead on the 30-minute mark, when a mix up in the United defence allowed Jonny Diack a simple task to slot the ball in the empty net. With the United faithful looking for a quick reaction they were soon to be disappointed as the pattern of the game continued as the first half and in all honesty Thistle were unfortunate not to go further ahead when Ramage was through one on one but this chip went narrowly over. Manager Andy Frame introduced Clark and Cunningham to try and inject some freshness into United’s play but the pattern of the game continued with Thistle on the front foot and once again only poor finishing kept the score down. United got what they deserved and will seriously need to up their game for the crucial visit of league leaders Benburb to Guy’s Meadow on Saturday.